Another New York food must is a visit to Katz's Deli. Famous in New York for decades for serving the best pastrami and hotdogs in the city before Meg Ryan and Billy Crystal had their highly satisfying meal there in When Harry met Sally. The stats back this up with the deli serving 5000 pounds of corned beef and 12,000 hotdogs every week. 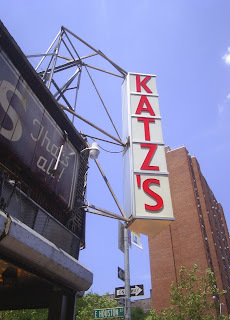 The queue to get in is also testiment to Katz's quality and popularity. We stood in line for a few minutes before being handed a ticket and ushered through to one of the many secondary lines at the counter. For the uninitiated the system for ordering is more than confusing. We made our way forward in one of the sandwich queues and got to the front. 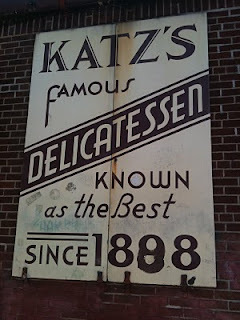 We ordered the classic Katz sandwich of pastrami on rye with pickles. The pastrami was sliced in thick hot chunks and then piled high in between two slices of Rye sourdough. 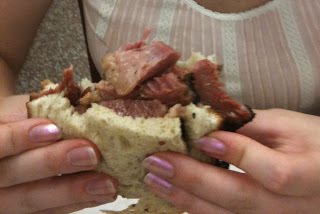 It's big and not pretty but the pastrami is soft, fatty and very satisfying. We shared this sandwich and it was enough for our lunch, I wish we could have gone back to try their corned beef and hotdog. It's all coming back. The shear calorific deathliness of Katz Deli, but what a way to go! Did you have room for an evening meal? We did manage dinner at Per Se! We did share the sandwich and our reservation for the evening was at 9:30 but we were struggling to finish. I don't know how New Yorker's manage to resist eating at Katz's or similar delis every lunchtime!